One of the many things we love about Aromatherapy Top 8 Essential Oils Basic Sampler Gift oils is their versatility. 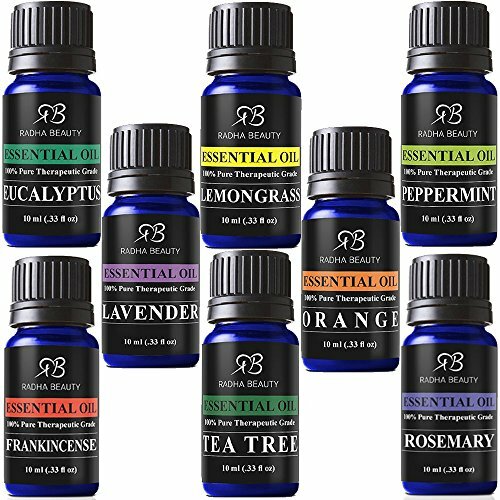 Our Aromatherapy Top 8 Essential Oil Set has eight (10 mL each) essential oils that can be used for aromatherapy, custom massage and body oils, diffusers, vaporizers, oil burners, inhalation, perfume, blends, spa, home care and cleaning products. Great for traveling, gifts, or experiencing a little bit of everything in your oil collection. Lavender: It is the essence of pure calmness and relaxation. This versatile oil gives off a light scent, which uplifts the spirit while transitioning moods to the ultimate state of calmness. Tea Tree: Antiseptic properties, invigorating and refreshing scent. Lemongrass: A great herb for inducing relaxation and balance for the mind. Eucalyptus: Naturally anti-inflammatory, refreshing scent! Orange: Promotes positive attitudes and induces relaxation for a calm spirit. Peppermint: Calming aroma will liven up the mind, body, and soul. How can anyone really complain about this warranty from the company? So their warranty pretty much overshadows a lot, if not all of the complaints. There does not seem to be any risks with the purchase of this product. So its acceptance is pretty much established by two different marketing demographics. The price is excellent for a set of 6 oils. It represents a value price deal, especially for those just starting with essential oils. Did we mention the warranty? Lots of product-for-reviews. Incentive reviews are what we think of them theme. Do we believe the report is unaffected by the discount or gift of the product? We do not. The negative reviews were well within the expected 5%. However, they were very common in their complaint. The complaint was about the quality of the oil. “Not pure,” “Not Therapeutic Grade” and not a good smell. Here is what we think is going on. The [current] price is $16.95 for 6 oils. That is a downright unbelievable bargain for the grade of these oils. That price would attract Experienced essential oil users who know the oils very well and would complain when their standards are not perceived to be met. In the meantime, the price also attracts people just starting out in oils. When compared to other packs which are more expensive, one expects new users to have a much more positive experience with the product. So here is what we recommend. This is a great starting out product.